Having good woodworking tools at home can be very handy and in a lot of ways convenient for you. This specifically works for me as it makes fixing things, doing wood alterations and other DIY wood projects very easy to do. As much as we want to preserve our furniture and stuff at home to be scotch free, but through time and daily usage, that may not be an easy thing to maintain. Knowing and doing it yourself proves to be more useful and economical way than bringing it to the shop. Learning the basic and mastering as you go along and armored with a good tools, you are in your way to create a professional-like finish. This DEWALT DCS331B 20-Volt MAX Li-Ion Jig Saw has been a great help in this whole process that I am just more than glad that I have discovered this tool. Most professionals are using this jigsaw because of its different adjustable settings and high speed. These features make their performance even better and improved thus achieving quality products in a timely manner. Because it is cordless, it cannot be used for a longer period when cutting for heavy material because the battery may drain faster especially when power is used at a maximum. It is however ideal for home use because, though advanced in settings, it is easy to operate and user friendly. For quick and easy fix, cordless jigsaw can be more advantageous as you wouldn’t need to plug it every time you use it. And with the batteries, you only need to recharge it when drain and can use it for longer period. When buying a jigsaw, aside from the different performance feature, you also have two option of whether you want to buy the corded-electric or the battery-powered saw. Though both can be at par in usage because that can be depending on both their elements and features, why would you choose a cordless saw? When you check or read the features, this can be determined by the amp or volt. Higher power will mean higher productivity and performance as it will measure its capacity and ability to cut wood, metal, steel of other materials. This is important is looking for a good jigsaw as well as it will allow you increase of output and precision of cut. The higher the SPM, may mean higher speed, saving you time without sacrificing the quality. This is the ability of the jigsaw to be tilt and used in varying degrees. Again, parallel measurement can be applied here as the higher the degrees of the saw capability, 45 degrees bevel cut for example may mean more flexibility for the saw to any material applications. This will allow the saw to have the capability of different movement for more versatile cuts. Normal jigsaw has only one straight line drive, but with higher orbital settings, it can be moved to any directions, thus allowing it to make other shapes including curve cuts. A jigsaw with a four orbital settings is a good one. Built for power, performance and ease, DEWALT DCS331B 20V MAX Jig Saw is designed to fit to your needs especially for any of your DIY projects at home. It has enough power to be used in any application and cut to any kind of material including metal and steel. It has adjustable features that will give you variety and versatility of uses. Its other features are also designed for comfort and convenience so it will be easy to use even changing the blade itself with the aid of its all-metal lever action keyless blade change. Its package comes with a jig saw and a jig saw blade. Batteries is however have to be purchased separately. With the speed of 0-3000 stroke per minute, DEWALT DCS331B 20V MAX Jig Saw is a perfect use for cutting not only you wood projects but also aluminum, metal and other objects. You have the control over the speed of it depending on how you want and need it for, by pressing the trigger harder, you will get a higher performance result. The four-position orbital settings allow you variety and quality of cuts. It will not only provide you a one direction straight movement but other possible orbital drive, thereby allowing you to make curve cuts as well. This jigsaw is designed with an all metal keyless shoe bevel with detents of 0, 15, 30 and 45 degrees that will allow you different cuts of material as well. Its keyless feature will make it easy for you to lock and unlock it when it use. Its ability to be used in different application of material and different cuts makes this jigsaw flexible and versatile to use. Its cordless feature will allow you an increase availability of the jigsaw as compare to using the other kind, which is electric operated. With this, you will not be worried of the accessibility of the plug or power supply when you use it or the hassle of using an extension cord for a far work place. This jigsaw is also designed with an anti-slip comfort grip for added comfort when holding the saw. For your convenience and to save time, the adjustable dust blower is a good feature because the saw itself will clear and clean the cutline, hence enabling you to concentrate and focus solely on holding and cutting it. This means to unnecessary pauses and stops just to wipe the area from the dust. As part of this review, it is just as important to also view and read what the customers who have used it have to say about this product. And as a consumer myself, it is important for to buy only the best, hence exhausting all possible sources and information that is available be it asking for friends’ opinions or researching online. From most of the reviews I've come across, people particularly like the solid performance, versatile and that it is a substantial tool. A lot has also mentioned about the blade being quick and easy to change without any hassles. The fact that it is cordless has its own advantages as well. However, it also has some drawbacks like its heavy weight for example that was pointed out several times. A lighter tool surely has an advantage because you will be able to keep holding it for a longer period. Though the blade is very easy to change and adjust, it would come out involuntarily in some occasions. Overall, the product is good because it works great, as the majority’s exact words and at the end of the say, it does the job with flying colors. This model of cordless jigsaw also from Dewalt also has an all metal keyloess blade change that makes it easy to change the blade as well. Its four-position orbital action allows it this jigsaw to be used for different cuts and increases the speed of its performance. With the adjustable blower, you can be assured that the cutline with be free from dust all through the time you are using. Its keyless blade is applicable for both universal and t-shank blade. Its other features include the all-metal keyless shoe bevel that features 0, 15, 30 and 45 degrees detents and anti-slip comfort grip. It does not come with a battery or charger, however. Like the other Dewalt models, this too has these following features namely; an all metal e-action keyless blade that allow changing of battery quickly, a keyless shoe bevel at 0, 15, 30 and 45 degrees, 4-position orbital action for control and quality and speed, an adjustable blower that clears and cleans the cutline while you saw and also run by a 0-3000 SPM power that will provide fast and quality of performance allowing you to cut not only straight but also curve lines. This model is powered by DEWALT’s 18-volt XRP batteries that are included in this kit along with the one-hour charger. This cordless jigsaw from Makita has a variable speed motor of 0-2,600 SPM and is designed with three orbital settings for faster work for a wide range of materials. Its tool-loess blade change makes installation and removal of the blade an easy job. For added convenience, it comes with large two-finger variable speed trigger for easy grip. It is made to be durable by the heavy-gauge precision machined base for smooth cuts and sturdy construction. Another part of the collection of Dewalt cordless jigsaw, this model has an anti-comfort grip design for the users to hold and handle the tool conveniently. This package, aside from the tool itself comes with a battery, charger, jigsaw blade and a kit box. All other features from other Dewalt are also present like the key-less blade change, keyless shoe bevel with 0, 15, 30 and 45 degrees, four orbital actions, SPM speed of 3000 and an adjustable dust blower for a high quality performance, great experience and outstanding output. Compact size and lightweight, this Bosch JSH180BL jigsaw is made to be durable and convenient to use. It is also designed with four-stage orbit settings making it adjustable, versatile and fast and provides a one-inch stroke length that power through wood, aluminum and steel. Other features include one-handed blade change, a carrying case and insert lay for safe transport of the tool. This model of jigsaw has the shortest trigger-to-blade distance and smallest grip circumference which could pose as both a good and a bad thing. The package comes with a tool only, battery and charger has to be purchased separately. Fixing and building our furniture can be made possible and easy with a reliable jigsaw to help get the job done in the fastest and most convenient way. It is therefore important to choose one that is high in power as that will expedite the process, adjustable orbit settings that will provide us with variety and versatility of cuts, and easy to maneuver, easy to change and adjust blades for added safety. 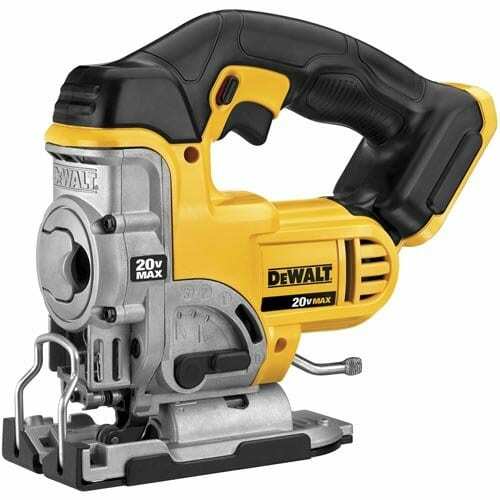 Also with its cordless feature, DEWALT DCS331B 20-Volt MAX Li-Ion Jig Saw can be the ideal jigsaw for you, as it makes it available to use anytime without the hassles of looking for extension cords and a power supply just to make it work. Its other features provide you with the comfort and ease for home use, but with a professional and an exceptional performance. With its great use, performance and productive output, you will get good value for the price.